Arsenal ace Santi Cazorla took to Instagram to bid an emotional farewell to Francis Coquelin who left Arsenal for Valencia. Cazorla acknowledged the great personality of Coquelin and wish him best of luck! However, Carzola while thanking fans and colleagues for their support and well wishes, announced the birth of his son Mateo who was born “extremely” prematurely. Cazorla is currently our injured with ankle problems and comes to the end of his contract by the end of the season. 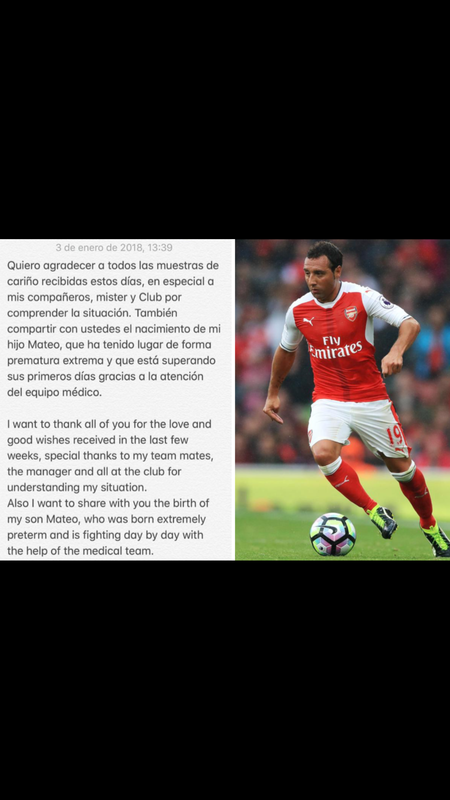 here is wishing Santi Cazorla and baby Mateo the very best of luck!